It’s fall, and certainly that means all-you-can pumpkin. I love pumpkin so much that when fall comes around, I question why I don’t ever bake anything pumpkin the rest of the year! And while this whole pumpkin spice business is getting a bit out of hand (and by the taste of it, “pumpkin spice” refers more to the spice than the squash) – I’ve seen pumpkin spice tortilla chips, PopTarts, pudding, cookies, non-dairy creamer, ice cream, english muffins – you name it, they’ve pumpkined it! But forget about all that. You NEED to taste THIS pumpkin cake. It’s one of my go-to recipes when I want pumpkin cake but I’m not in the mood to grease and dust mini pans for my pumpkin bread. This particular cake is a bit dense, heavy on the pumpkin taste, gently touched with cinnamon and finished off with a squirt of whipped cream. I promise, it’s yummy! My aunt’s original recipe called for this to be made in a 9×13″ pan. Her recipe notes, however, said she made it in an angel food cake pan, but I prefer a fancy-pants bundt cake pan. Yes, let me get all fancy-pants before I spill powdered sugar on my yoga pants, because that’s how I roll. Let’s bake some pumpkin cake! Before you start, preheat your oven to 350º. Grease and flour (ever so lightly) your pan of choice. This is one of the few times I actually bother to sift (lazy) but I do. Sift all the dry ingredients in a large mixing bowl and give them a quick stir to combine. Measure out 2 cups of pumpkin. This will leave you with some left over, so just put it into a container and set it aside to make a homemade pumpkin spice latte. I’ll give you the recipe in a flash. Mix all that pumpkin-y goodness together, and pour it in your floured & greased pan. Bake until a toothpick comes out clean; about 45 minutes for a 9×13″ pan, or more like 50-55 minutes for the bundt or angel food cake pans. Cool for about 5 minutes in the pan, then turn out onto a wire rack to finish cooling. When cool, move the pumpkin cake to your serving plate and dust with powdered sugar. (I like to tuck waxed paper around the edges of the plate to keep the presentation tidy while I’m dusting.) If you’ve rinsed out and dried off the sifter, pull it out and use it to sift the powdered sugar – it keeps the distribution more even! If you like, you can top it with a bit of whipped cream. Just a touch, don’t overdo it. Ok, you can overdo it if you want. It’s your pumpkin cake. Doesn’t that look delicious? Grease and flour a 9x13" pan, bundt cake pan or angel food cake pan. Give dry ingredients a quick stir to combine. approx 45 minutes for a 9x13 pan, approx 50 minutes for bundt or angel cake. Let cool for 5 minutes, then invert onto wire rack to finish cooling. Dust cooled plate with powdered sugar. So do you fall in the “I like pumpkin” camp? C’mon – tell me – what is your favorite pumpkin dessert??? I have to admit that the pumpkin pie pop tarts are actually good! I can’t bring myself to try them. Besides, I’m I’m splurging on a pop tart, it’s gonna be a cherry one! Oh, and if YOU try this cake in a bundt cake pan, you (and only you) will want to pull it out at 50 minutes, because it is *just* undercooked to YOUR liking, crazy lady. Oh yes, I’m definitely in the pumpkin camp! 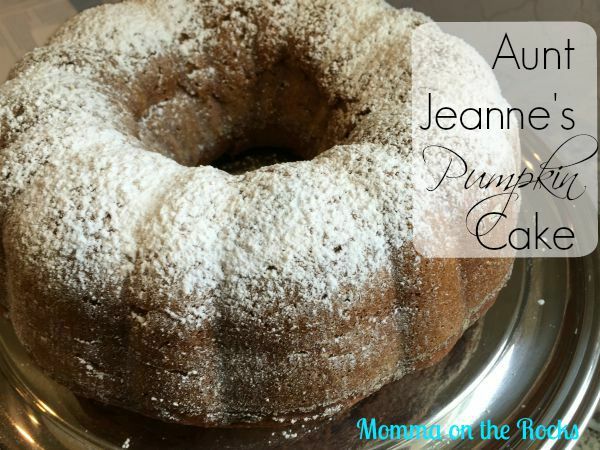 And today is fall so I’ll be trying this cake recipe out – thanks for sharing! Every time I make this , i do the dust it wit powdered sugar. I need to edit this to add an icing glaze. I need this cake in my life — sooner rather than later. It’ll be perfect for taking to tea with my girls. It’s yummy! I will admit, its more humid here in Texas than I’m used to this time of year so the cake just soaked up the pretty dusting of powdered sugar. The next time I make it, I’m going to add a powdered sugar glaze. I should add the recipe in! I am all about all things pumpkin in the fall. Putting this on my baking list now! OK, I still haven’t tried this pumpkin cake because we can’t get past your pumpkin bread. If I pull out a can of pumpkin Aidan is standing there waiting with the mini bread pans! One serving = one mini loaf pan. However, I think I have to try this recipe this weekend…I guess it will be a pumpkin cake and pumpkin bread weekend!